The NOTAM gives the reasoning for the enforcement as a being due to a law enforcement operation. 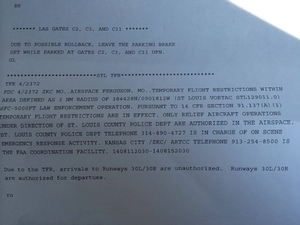 Only relief aircraft operations under the direction of the St. Louis County Police Department are allowed in the airspace over Ferguson until the restrictions are lifted. The temporary flight restrictions create a no-fly zone in a 3 nautical mile radius (around 4.5 miles) around Ferguson. According to Google Maps, the center of Ferguson is less than three miles from the edge of the airstrip at Lambert–St. Louis International Airport, but according to the airport it is still open. Civil unrest has been amplifying all week in Ferguson following the shooting of 18-year-old Michael Brown by a Ferguson police officer on Saturday, Aug. 9. Riots and looting began the next night and spilled over into Monday when it was reported that police used tear gas and rubber bullets on the crowd. 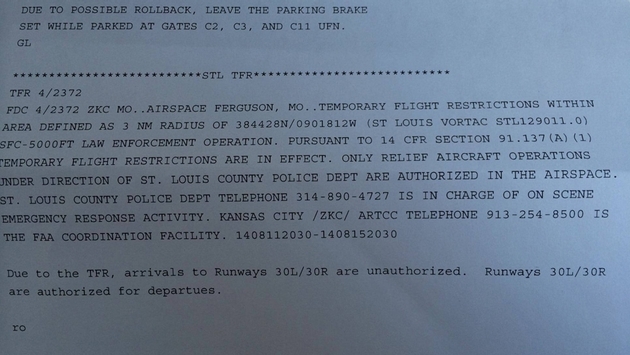 The NOTAM did not say when the restriction would be lifted over Ferguson airspace.